Mother’s Day – the one day a year where we take the time to thank and celebrate the inspiring women in our lives. A day that is placed in our calendar which encourages us to properly reflect on all of the wonderful things that our mums, nanas, aunties, carers do for us on a daily basis. This day is about appreciating the small things that they do for us every day. Whether this is waking us up in the morning with a coffee or tea, or being there to give advice and guidance on the hurdles that appear throughout our whole lives. Mother’s Day give us a chance to return the favour. To celebrate Mother’s Day, this Sunday 11th March we asked our friend Kiren, from the amazing interiors Instagram account @MakingSpacesCount to share the wisdom and advice she’s been given from her Mum using #ChristyMumsKnowBest. Team Christy met Kiren at a No House Rules interiors event and we were blow away with Kiren’s Christy story. Get yourself a cup of your favourite drink and take five getting to know Kiren and reading her Christy story. Tell us your Christy story. 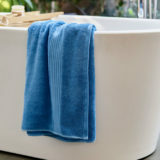 When I was going away to University at 18, my Mum bought me a set of blue Christy towels- I leaned to appreciate quality and as I grew older I continued to buy from Christy. Now I have the great pleasure of introducing the brand to my Foster children, many of whom have never had comfort and luxury items. 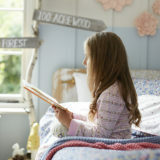 To see a child relax in gorgeous fluffy towels, and clean, soft bed linen for the first time is absolutely priceless. And I still have my original blue towels- many years later- they last forever! When did your passion for interiors begin? When I bought my first house! I had always loved clothes and fashion and all of a sudden, I had free reign to do as I liked with a whole house! I immediately painted a room in a dark blue, including the ceiling- and I still adore it! Describe your interior style in 3 words. What’s your favourite room in your home? My bedroom. 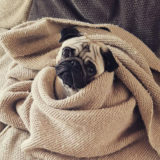 I’m very lucky to have a huge bed and I love to sleep. I don’t think I ever grew out of my teenage habits! These days sleep is precious so I enjoy every moment! There’s nothing better than getting into a freshly made bed with clean and luxurious linen! Press the snooze button! Then I go downstairs, give my dogs a cuddle and let my chickens out of their coop! If I’m lucky they’ve laid some gorgeous eggs for breakfast! What makes you smile the most? Being at home with my husband and dogs, in front of the fire, eating cake! In the spirit of #IWD2018, what women have inspired you? My mum. She went back to work when I was 6 weeks old and has always worked full time, but we always had amazing home cooked food and got taught the value of money. What’s the best piece of advice or wisdom you’ve ever been given, because our #ChristyMumsKnowBest? Everything tastes better with cheese on! But on a serious note, be kind. Thank you so much to Kiren for sharing her Christy story. Make sure you’re following Kiren on Instagram @makingspacescount. We’d love to hear the best piece of advice or wisdom you’ve ever been given, share on Facebook, Twitter and Instagram using #ChristyMumsKnowBest. Sleep: How does this affect you? Christy was established in 1850. 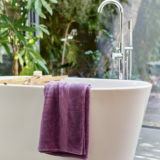 Christy towels are associated the world over with opulence and style and our beautiful bed linen designs are trend led. © Copyright Christy Towels UK 2019.